Enrich your travel experience at Durham Marriott City Center. 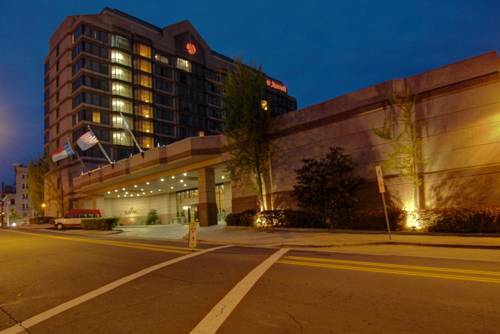 Our stylish hotel provides an unbeatable downtown location next to the Durham Convention Center. Visit a multitude of destinations including Duke University, the Durham Performing Arts Center, Museum of Life and Science and Carolina Theatre nearby. In between adventurous outings, make yourself at home in our contemporary rooms and suites. Feel at ease with our trendy d cor, convenient room service and plush bedding. Our accommodations also showcase picturesque city views. Worked up an appetite? Visit our on-site restaurant, Table South Kitchen & Bar, for a delicious selection of American cuisine and handcrafted cocktails. Delight in even more refreshments at our M Club Lounge. Continue your exercise routine throughout your travels, courtesy of our 24-hour fitness center featuring cardio equipment. Whether you're in search of a relaxing getaway or productive work travels, experience a refreshing stay at Durham Marriott City Center. Table South Kitchen & Bar: Our relaxed restaurant serves fresh, delicious American fare. We're open for breakfast, lunch, and dinner: stop by in the morning for breakfast before setting off to explore downtown Durham, NC, or join us for dinner and a cocktail after a busy day.